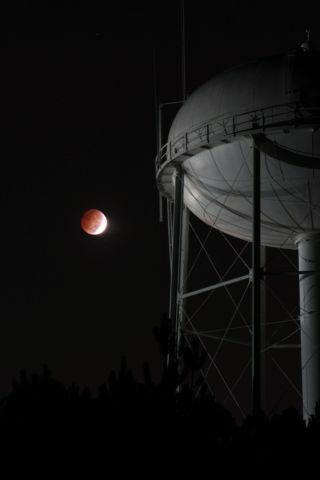 Astrophotographer Katie Whitman submitted a photo of the total lunar eclipse of Oct. 8, 2014, as seen in Georgia. A so-called "supermoon" full moon will pass through Earth's shadow in what promises to be a dazzling total lunar eclipse Sunday night (Sept. 27) for skywatchers with clear skies. But if Mother Nature ruins your weekend, don't fret. You can still catch the lunar sight online. The last time there was a supermoon lunar eclipse, in 1982, moon observers had few, if any, options to watch the celestial event remotely. But today, a multitude online webcasts will ensure the lunar show goes on, rain or shine — filmed from observatories across the world and guided by expert narration from researchers, historians, meteorologists and astronomers. And if you miss it this time, you'll have to wait until 2033 to see the next such event, according NASA. Slooh's webcast will start at 8 p.m. EDT (midnight GMT) and will incorporate views of the eclipse from three different countries, according to a statement, including eclipsing harvest moon's rise over Stonehenge in England. You can watch the Slooh lunar eclipse webcast here, and also get access to archived night sky webcasts. You can also watch the lunar eclipse webcast on Space.com, courtesy of Slooh. Viewers can ask questions on the eclipse via Twitter with the hashtag #SloohEclipse. NASA, meanwhile, will host its own live stream on NASA TV at 8 p.m. EDT, which will run through "at least" 11:30 p.m. EDT (0330 Monday GMT), officials said in a statement. NASA's webcast will be broadcast live from Marshall Space Flight Center in Huntsville, Alabama, and will incorporate views of the eclipse from the Griffith Observatory in California and a discussion with NASA solar physicist Mitzi Adams, who will also answer questions on Twitter tagged with #AskNASA. The astronomy magazine Sky & Telescope is hosting a webcast as well, starting at 9 p.m. EDT (0100 Monday GMT). The magazine's hosts will bring in expert astrophotographers to give advice on how to photograph the eclipse. They'll also introduce a long list of special guests: Charles Wood, a lunar geologist; MIT geophysicist Maria Zuber, lead scientist for NASA's Gravity Recovery and Interior Laboratory (GRAIL) mission, which maps the moon's internal structure by measuring changes in its gravitational pull; space historian and author Andrew Chaikin; and Sky & Telescope senior editor Alan MacRobert. The Griffith Observatory, whose views will be featured in NASA's video, will put up its own webcast of the event as well. Starting at 6:30 Pacific time, live from Los Angeles (9:30 p.m. EDT, or 0130 Monday GMT), the observatory will also invite guests to view the eclipse through binoculars and telescopes as they listen to live, moon-themed piano music from Steinway & Sons and the Los Angeles Philharmonic. In Arizona, the University of Arizona's SkyCenter observatory atop Mount Lemmon will feature an updating image of live telescope views on the SkyCenter website. The Virtual Telescope Project, operating out of the Bellatrix Astronomical Observatory in Italy under the direction of atrophysicst Gianluca Masi, will aim its robotic telescopes at the supermoon for a webcast starting at 9 p.m. EDT (0100 Monday GMT). The production will feature astrophotographers from all around the world. So, whether the sky is clear and the moon is bright, or conditions are murky, hazy or even in daylight, eager skywatchers will have a chance to watch and learn about the supermoon lunar eclipse with the help of online webcasts. It'll be the last time the events converge until 2033 — and who knows what technology will augment our viewing then! The Coca-Cola Space Science Center in Columbus, Georgia will host a live webcast of the lunar eclipse starting at 7:45 p.m. ET (2345 GMT). You can ask the questions on the lunar eclipse, as well as share photos, by emailing webcast@ccssc.org. Editor's note: If you capture an amazing photo of the supermoon lunar eclipse and want to share it with Space.com for a story or gallery, send images and comments in to managing editor Tariq Malik at spacephotos@space.com.